This activity is from Manualidades para niños; thanks to them for permission to embed the video with a translation and transcript. 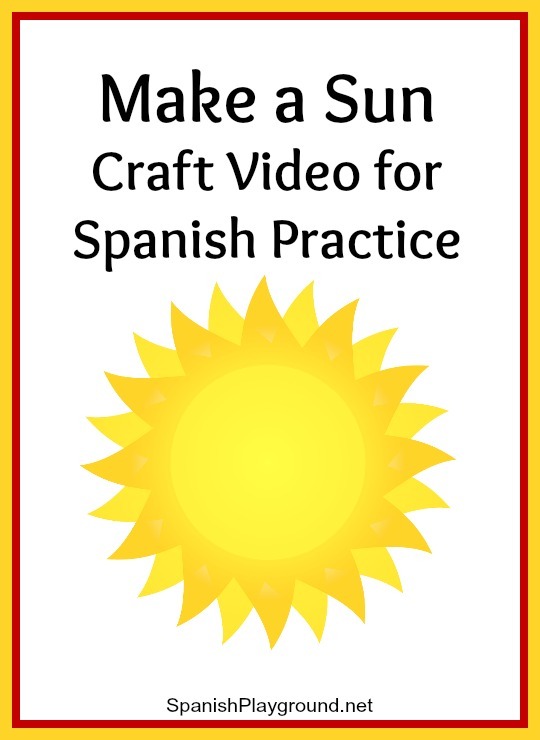 Make this Spanish sun craft with your child. It is a fun way to listen and understand native-speaker Spanish! Children hear native speaker language as they listen to the instructions for the Spanish sun craft. The images make the meaning of the words very clear, so they understand. Follow these simple steps to make the most of the Spanish sun craft as a language-learning activity. 1. Watch the entire video with your child. The content is about 1 minute long. 2. Start the video again, and pause it as you do each part of the project. 3. Repeat the key words as you do each step. For example, un círculo (circle), papel (paper), pegamento (glue), la boca ( mouth), los ojitos (eyes), los puntos (points). 4. Talk about the sun you are making. You can use simple phrases like these: ¡Qué bonito! Me gusta el sol. Me gusta este color. 5. When you have finished each step, back up and listen to those instructions again before going on. The actions you just completed reinforce the language. 6. When you are done, hang your sun where you can see it and talk about it in Spanish. 7. If you liked this Spanish sun craft, try making a butterfly with another Spanish craft activity and video. A transcript and an English translation follow the video. Corte el círculo. – Cut a circle. Ponga pegamento al círculo y péguelo al papel de construcción color naranja. – Put glue on the circle and stick it to the orange construction paper. Dibuje la boca en el círculo. – Draw a mouth on the circle. Ponga pegamento en los ojitos móviles y péguelos al círculo. – Put glue on the googly eyes and stick them to the circle. Corte los puntos del sol en el papel de color naranja. – Cut the points of the sun in the yellow construction paper.